Synopsis: The second book in the popular new Doon YA series that takes on a classic story, Brigadoon, and spins it in a new way to give readers a fresh, modern experience. 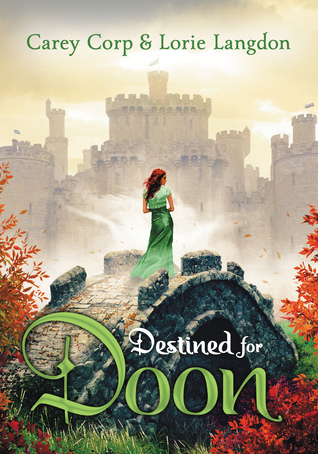 In this sequel to Doon, Kenna Reid realizes she made a horrible mistake-choosing to follow her dreams of Broadway instead of staying in the enchanted land of Doon. Worse, she’s received proof she and Duncan are meant to be, along with torturous visions of the prince she left behind. So when Duncan shows up and informs Kenna that Doon needs her, she doesn’t need to think twice. But even if Kenna can save the enchanted kingdom, her happily ever after may still be in peril. The Doon novels are a part of Blink, HarperCollins Christian Publishing’s new YA imprint that delivers empowering and heartening literature while maintaining a tradition of imaginative and impactful storytelling. Review: I feel like I liked this one better than the first one to be honest. I got approved to read the fourth book Forever Doon on NetGalley so I am quickly reading the second and third books in the series. They are good if you want fast-paced reads and to immerse yourself in another world for a few hours. I admit that they are a little childish at times and had me rolling my eyes but I did enjoy this book. Veronica grew up and became a much better character. I always wanted to read her POV chapters. I feel like there was a lot more action in this one! Mackenna and her stupid musical/broadway references… if I read ‘Holy Hammerstein!’ one more time I may light the book on fire.